At Friday's event IT Tralee awarded the President’s Civic Spirit Award. This award recognises the volunteering work our students undertake while progressing with their studies here in IT Tralee. Every student at the event committed their time and skills to their chosen projects whether on campus or within the wider community. IT Tralee supports and encourages volunteering among our students; we host an Annual Volunteer Fair across both campuses; we were also one of the founding members of StudentVolunteer.ie in 2015, a website that provides students with access to hundreds of volunteering opportunities locally, nationally and internationally; and of course each year we bestow the President’s Civic Spirit Awards which were established in 2013 to recognise and acknowledge the significant contribution of I Tralee’s student volunteers to the Institute and the wider community. 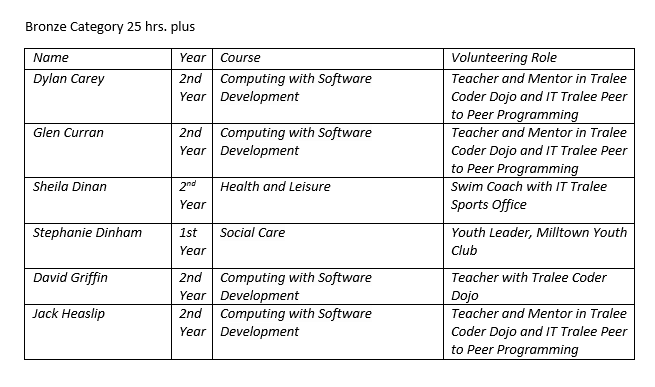 In order to be eligible for this award, students need to demonstrate a commitment of a set amount of hours to a voluntary organisation/project: 25 hours plus for Bronze, 60 hours plus for Silver and 100 hours plus for Gold. 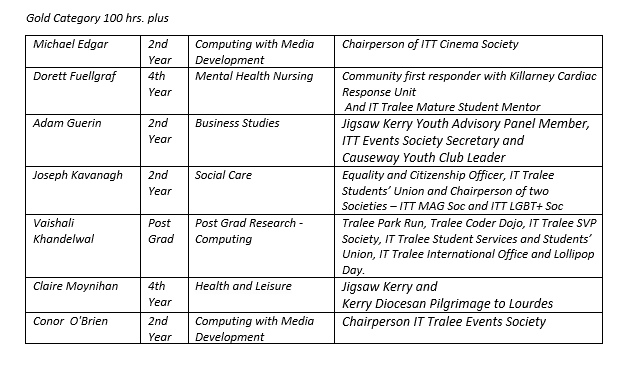 All students who submitted their hours for their chosen category and completed a reflective submission receive an IT Tralee President’s Civic Spirit Certificate. A Gold, Silver and Bronze Award will be bestowed on three candidates displaying outstanding volunteering experience and impact, as judged by the award selection panel. There is a strong volunteering ethos ‌among IT Tralee students, in fact a recent survey found that 60% of all IT Tralee students volunteer, committing an average of 3 hours a week. This year our students have volunteered with a vast array of organisations and projects, including a number on campus which have proved very valuable to campus life. Volunteering is of vital importance both to the organisations who need volunteers to help them run but also to the volunteers who get a chance to learn and build new skills and experiences. 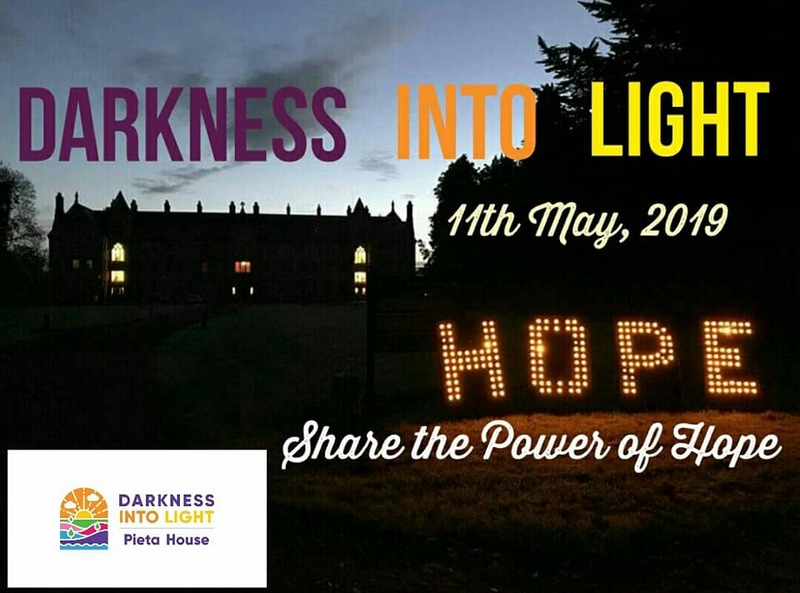 Some organisations who benefitted this year include IT Tralee Clubs and Societies, Peer Mentoring and Student Services on campus and Jigsaw Kerry, Tralee Coder Dojo and various youth clubs within the wider community amongst others. Congratulations to all our nominees and winners!